Free Home Purchase Loan Quotes. Good and Bad Credit Scores is allowed! FHA financing has become a very popular choice for home mortgage loans, especially with first time home buyers. 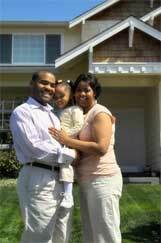 FHA mortgage loans are insured by HUD and only require home buyers to come up with 3.5% for a down-payment. Our home purchase lenders specialize in fixed rate loan offers from up to three competing FHA loan specialists from across the country. Home mortgages insured by the FHA have seen many new changes that have resulted in a recent surge in government home mortgage applications from first time homebuyers. The average 30-year fixed mortgage rate fell from 4.875% to 4.75% for the seven-day, according to Primary Mortgage Market Survey, conducted by Freddie Mac. The average 15-year fixed mortgage rate fell from 4.625% to 4.5%, the average rate for five-year Treasury-indexed hybrid adjustable-rate mortgages declined from 4.15% to 3.875%, and the average rate for one-year Treasury-indexed ARMs decreased from 3.875% to 3.625%, Freddie Mac reported. Fees and points averaged 0.5 of a point for fixed-rate mortgages and hybrid ARMs, and 0.6 of a point for one-year ARMs. "Mortgage rates eased slightly this week following three weeks of increases," said Frank Nothaft, Freddie Mac's chief economist. "The initial effects of the credit market turmoil that began in August are starting to emerge in housing statistics. New-home sales in August fell to the slowest pace in more than seven years, and the median sales price had the largest 12-month decline since 1970." A year ago, the average 30-year and 15-year fixed rates were 6.30% and 5.98%, respectively, and the average hybrid and one-year ARM rates were 6.00% and 5.46%, Freddie Mac said. Freddie can be found online at Freddiemac.com. According to American Banker The U.S. Department of Housing and Urban Development's reforms to the Federal Housing Administration loan program to streamline appraisals and enable lenders to charge conventional closing costs have prompted a number of lenders to aggressively market these mortgages to home owners looking to refinance out of adjustable-rate products. Experts say the changes have made FHA loans available to borrowers who previously had no choice but to obtain sub-prime financing. The Mortgage Bankers Association, however, reports higher foreclosure rates for FHA loans than prime mortgages. In addition, consumer advocates say fraudulent income statements and flipping schemes are problems for the FHA program. Meanwhile, HUD has proposed additional reforms that would hike loan limits, implement risk-based credit scoring, and enable borrowers to forgo down payments. Request a FREE FHA Home Loan Quote online and learn how to buy a home cost effectively.